Virginia thistle growing with goldenrod and beautyberry on Jamestown Island, Virginia. We headed out onto the Colonial Parkway yesterday afternoon, to see what we could see. We were watching for signs of the changing season, and of course watching the sky for signs of the approaching storm. Hurricane Jose was swirling out in the Atlantic, well away to our southeast. Even so, the outer bands of this enormous storm were already creeping across our sky. 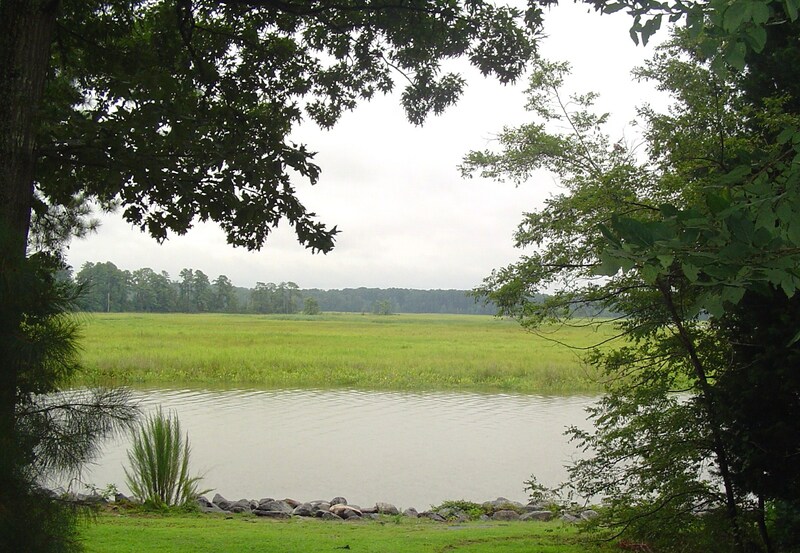 Once we reached the ‘roads less traveled’ on Jamestown Island, we were delighted to see bright purple beautyberry, Callicarpa dichotoma , bright golden Solidago, yellowing marsh grasses and occasional reddening leaves. The outer tips of branches on our native dogwoods, and some maples, have begun to change into their autumn finery. Yellowed Poplar leaves have been falling for weeks now. A few inky purple berries still cling to magenta stems on the many native Aralia spinosa trees lining the road. Their leaves will soon turn golden, too. We stopped in a few of the pull-offs on the island to read the signs yet again, and for me to hop out to take a few photos. As we approached one pull-off in particular, along the longer Island Drive, I was intrigued by the bright wildflowers and purple berries right beside the road. A pull off on the longer Island Drive on Jamestown Island. In addition to the vivid beautyberries which lined the whole of the road in abundance, and the stands of goldenrod, there was something uniquely different. This had flowers like a thistle, but on a radically different tall and lanky plant that I’d never noticed before. What was it? The wild thistles we’d seen on Ocracoke Island, many miles to the south, were much stockier and shorter plants with larger blossoms. I quickly ruled out perennial Cardoon, and every other ‘thistle-like’ plant I’ve known. We have a passing acquaintance with most all of the native trees, ferns and perennials in the area. And this one was new to us. Perhaps we’d never visited the island at precisely this point in the seasonal progression before… And so I took lots of photos, and determined to investigate the plant later, at home. As it turns out, the plant we found is a native of the Southeastern United States, called Cirsium virginianum, or Virginia thistle. A biennial, it prefers moister, sandier soils along the coast. It has a dangerously thorny stem, long thin leaves, and had grown a bit taller than I stand. In some areas along the Gulf coast, it is considered a ‘noxious weed.’ But in Virginia, it is still relatively rare, at least in my experience. I enjoyed the natural combination of its lavender blossoms growing against a back drop of purple beautyberry, with a skirt of bright goldenrod. For this forested, marshy island especially, this was a rare colorful sight along the road. The beautyberry is rampant now in our garden, too. In fact, so many volunteers have appeared that we often must cut them back throughout the season. This is one of the plants I cut back hard in early spring to somewhat control its size. One of the larger beautyberry shrubs in our garden, which we cut hard every spring, reaches up for the lower limbs of the dogwood tree which shelters it. Solidago has self-seeded in sunny parts of our garden, too. And we have a single berry-topped Aralia proudly presiding over it all. A neighbor tipped me off to how badly the Aralia can sucker, and so I ruthlessly cut out the many small clones trying to grow up around the main stem this spring. I suppose that will be an ongoing part of our garden routine from now on. Our Aralia, in its first season of bloom, surrounded by native Phytolacca americana, or pokeweed, another rampant native plant. The birds love these berry laden natives. There are definite advantages and disadvantages to inviting native plants into one’s garden. It is something to consider, especially for aging gardeners who want neat, easy maintenance landscapes around their home. Native plants self-seed easily, and often grow and spread with enthusiasm. It can take great effort to control them, especially if they establish on good garden soil, in areas tended and irrigated to keep them productive. We are nearly overrun with the stunningly beautiful Rudbeckia hirta and Rudbeckia laciniata. They both quickly claim far more real-estate than a gardener plans to give them. Three natives growing together in our front garden: black-eyed Susan, Rudbeckia hirta; mistflower, Conoclinium coelestinum; and obedient plant, Physostegia virginiana. A Master Gardener friend gave us a large clump of obedient plant this spring. I divided it into several smaller clumps, and planted them in different areas to see where they perform best. I am thrilled that this beautiful plant survived our summer drought and is blooming this first year. The R. laciniata wasn’t even invited; a gardening friend gave me a clump of white Monarda passed on from her friend, and some R. laciniata roots just happened to be in the clump. But these gargantuan, flower covered plants are now filling my former ‘butterfly garden.’ I must tend to their removal this fall, when the weather cools, and weed them out ruthlessly next spring. Rudbeckia laciniata now fills what once was our butterfly garden, filled with various flowering shrubs and perennials. I intend to weed most of this out over the next month, sharing it with a friend who wants it! The Rudbeckia hirta I shared lavishly with all gardening friends who would accept a few this spring. I dug up clump after clump, and still have the largest, lushest stand of it, ever. There are worse things than a sea of golden flowers come August and September, I suppose. The rich drifts of perennials one admires in public gardens are attainable with natives, without stretching the budget, I’ve learned. This is the season for native plant sales, sponsored by local native plant societies. This is a good service for communities and enables more of us to grow natives, if we choose. While I support the effort in theory, I must admit that in general I prefer more curated, controllable cultivars. Self-sown Solidago in our garden, a week and a half ago, nearly ready to bloom. It has just begun to show color, and will be fully in bloom by next weekend. This huge perennial attracts many pollinators and provides late season nectar for our bees. But, large natives often shade and crowd out the more desirable cultivars of perennials one has purchased for the garden…. Yes, I acknowledge the many and varied benefits native plants offer wildlife, and we absolutely grow our share of natives here. That said, a word to the wise: carefully research and observe any native plant you want to grow, before you invite it home to your garden. Let the natives you grow remain natural beauties, and may they never cross that line to become noxious weeds, overtaking your garden. Early spring, as the buds swell and glow red or orange or softest green around the crown of every tree on the horizon; directs our attention back towards our majestic, elegant hardwood trees which fill the landscape here in coastal Virginia. We’ve largely ignored them since autumn, when their bright leaves blew away in November’s storms. The many native trees discovered by our early colonists still grow wild here. They form the backdrop to our everyday lives. Some of us love them and choose to live in forested communities. Others fear them. Perhaps for good reason, after seeing these gentle giants toppled by the storms which blow through our area several times a year. Yet, the great North American trees define our landscape and our lifestyle. They shade us and offer relief from our summer heat and humidity. Their flowers announce spring and make early summer sweetly fragrant. The ready supply of good strong trees for lumber allowed early settlers to build homes and churches and businesses in the wilderness. 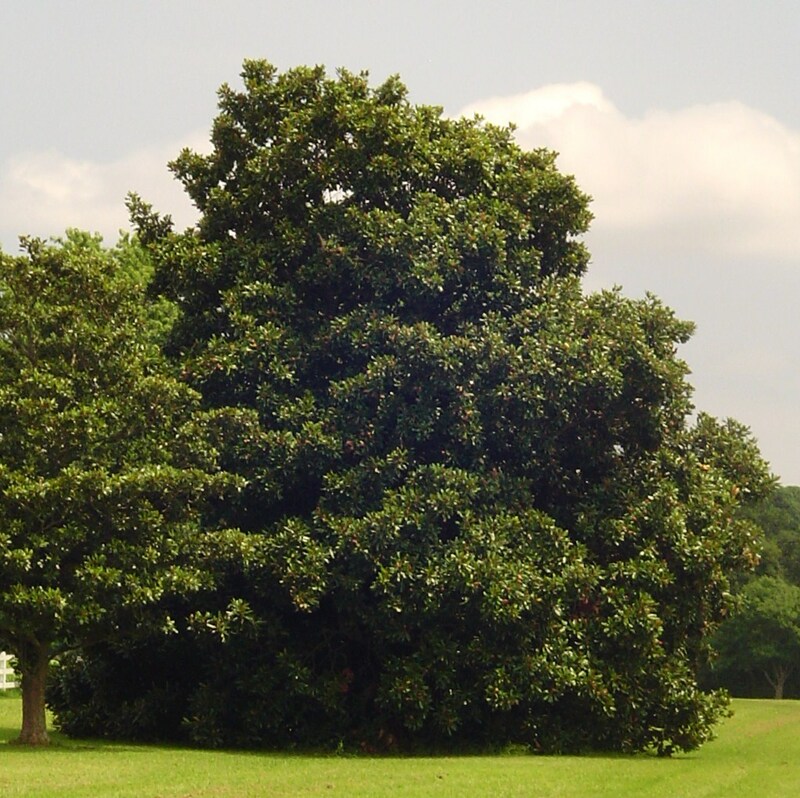 Although it is unusual to find a fully grown, mature hardwood tree anymore, we still can find them in parks and on preserved estates. Cypress Trees grow large here along the Colonial Parkway at the mouth of Powhatan Creek. I love trees. And I love to plant trees. I count and visit the Dogwoods, Oaks, Redbuds, Crepe Myrtles and Poplars on our property pretty regularly to monitor their growth. In fact, I spent an hour today with a shipment of bare root trees we just received from the Arbor Day Foundation. I get angry when neighbors cut healthy trees, changing the landscape for our entire community. And I really hate to see stands of trees cut for new development , mourning the ever increasing loss of the naturally forested acres left in our area. We often fail to consider how much oxygen each tree produces each year, or how many pollutants each can filter from the air we breathe. Trees absorb greenhouse gasses like carbon dioxide in their respiration, locking that carbon into their woody flesh. They help moderate the temperature through all of our seasons, and fertilize the Earth and build new soil with their fallen leaves. Each tree supports and houses countless animals, feeding and sheltering birds, small insects, butterflies and their larvae, and small mammals. Native Redbud, Cercis canadensis, blooms in April. Since trees are on my mind today, I am republishing an essay I wrote in August, 2013, about how prized our American trees became to the Europeans who financed and supported colonization in North America. I hope you find some useful bit here you didn’t know before. And I also hope that perhaps this essay invites you to pay a bit more attention to the trees in your landscape and your life. View towards Jamestown Island from the Colonial Parkway. Did you know there was a time, not too long ago, when the most prized plants growing on regal British estates were trees imported from, “The Colonies”? I had no idea how much 17th and 18th Century British gardeners coveted North American plants- particularly our trees. American Sycamore growing along the Colonial Parkway on the bank of the James River. Isn’t it interesting how things are forgotten over the years, and we assume that how things are in our own experience is how things have always been? I grew up on the East coast of North America, making annual trips to view the colorful forests cloaking the Blue Ridge Mountains each autumn. I’ve always had brilliant autumn foliage to enjoy in my own yard, and lining the streets of whatever town I happened to visit. We in Virginia accept these things as part of the normal progression of the seasons. We savor them, but don’t take notice of what a rare treat we enjoy. 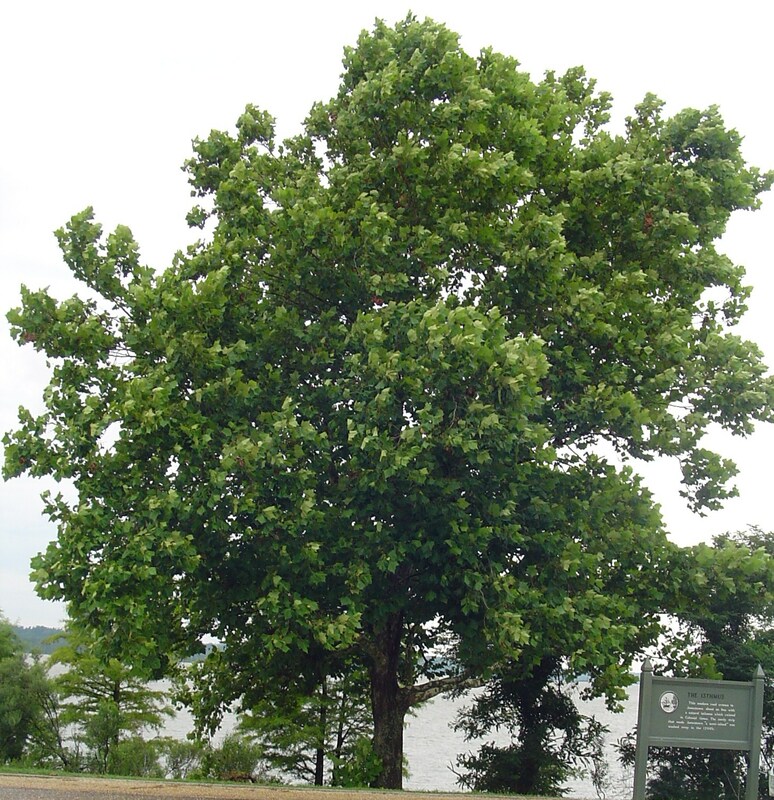 An oak tree growing beside the James River near Jamestown. 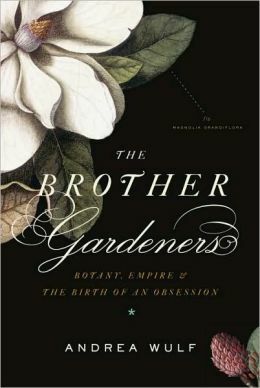 It was the book, Brother Gardeners: Botany, Empire, and the Birth of an Obsession, by Andrea Wulf, which opened my eyes and my mind to the treasures growing here, as weeds in the woods. Prior to the 17th century, European, and specifically British gardens, had a limited palette of plants. The formal geometric schemes of lawn, hedge, topiary evergreen shrubs, roses, and very few summer flowers were the norm. Green and brown were the main colors found in the garden for most of the year. Hardscape paths, stairs, fountains, arbors, and structures were the relief from all of this green lawn and green hedge. Gardeners overcame and reshaped nature when creating a garden. The notion of working with nature was born in the colonies, and exported back to England in some measure toward the second half of the 18th century. As European ships sailed abroad to explore and claim the world, they took as treasure not only gold and silver, but also botanical treasures from all of the lands explored. Very little of the plant material collected actually made it back alive to a gardener in Britain, France, Spain, Portugal, or the Netherlands. When a voyage lasts many months, things happen. Things like hungry mice and storms; gnawing insects, pirates, salt spray; and unmitigated heat and cold on the deck of a sailing ship. But whatever seeds, bulbs, cuttings, roots, and even live plants did miraculously make it home and into the hands of a skilled gardener, were loving tended and coaxed into growing in specially built hot houses and garden plots. Plants were grown out for seed, sold, traded, and propagated in great botanical gardens across Europe. Botanists befriended ships’ captains and crews in hopes of bribing them to bring home new specimens. And, as colonies were established, relationships sprang up between the colonists and avid collectors “back home” in Europe. 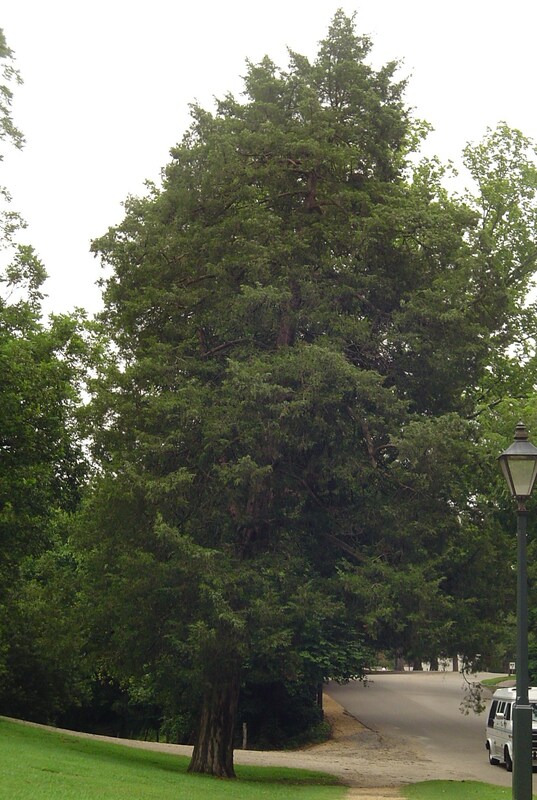 Red Cedar, Juniperus virginiana growing in Colonial Williamsburg. 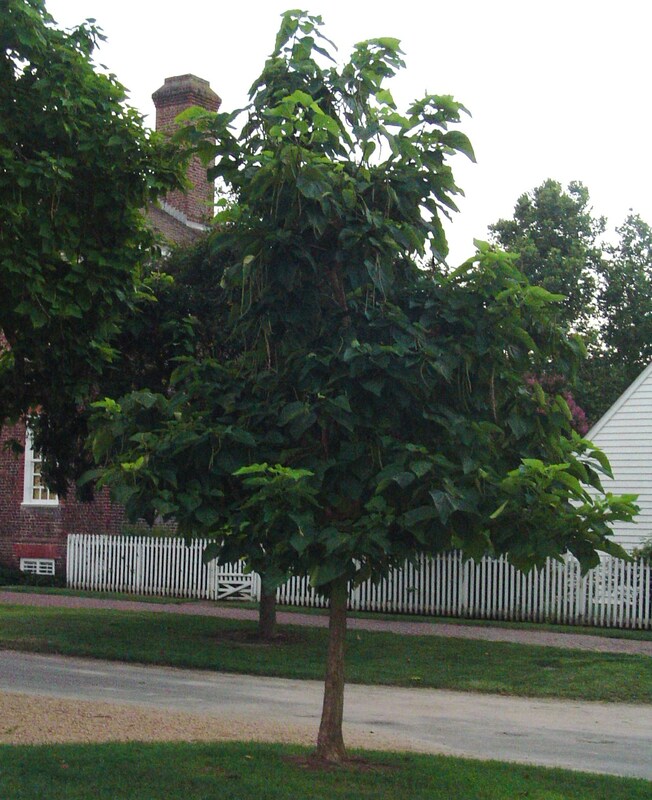 Catalpa, or Monkey Cigar tree, on the Palace Green at Colonial Williamsburg. The lawn is lined with Catalpa trees of various ages, and they are absolutely stunning when in bloom. Enlarge the photo and you’ll see the long seed pods growing in early August. The colonial era was an exciting time for discovering countless new species of plants. The gardens of Great Britain and Europe reflected the explosion of diversity by welcoming previously unknown flowers, trees, shrubs, herbs, and vegetables into their evolving and increasingly naturalistic garden schemes. Remember, the great forests of Britain were decimated long before this era. When Maple, Tulip Poplar, Pine, Sycamore, Cedar, Dogwood, Sassafras, Magnolia and other colorful tress and shrubs from America grew in the first garden plots of importers, they were a novelty. The aristocracy quickly fell in love with these new plants, and clamored for a seed or a cutting to grow on their home estates. Oak and pine grow in abundance on Jamestown Island. Benjamin Franklin helped build the relationships that enabled this trade between his amateur botanist friends in the American colonies and his contacts in Britain. The story told in Andrea Wulf’s book unfolds with the drama and personality of a good novel, and I recommend it to every like minded gardener, no matter which side of the pond you call your present home. For the purposes of this post, I will mention a few of the trees growing wild right here around Jamestown, which were collected in the Colonial era and sent back to England. These trees, common to us, opened up a whole new way to design and enjoy gardens for those still in Europe. They were grown for their beautiful form, fall color, interesting bark, and some for their flowers. An old oak tree’s exposed roots. 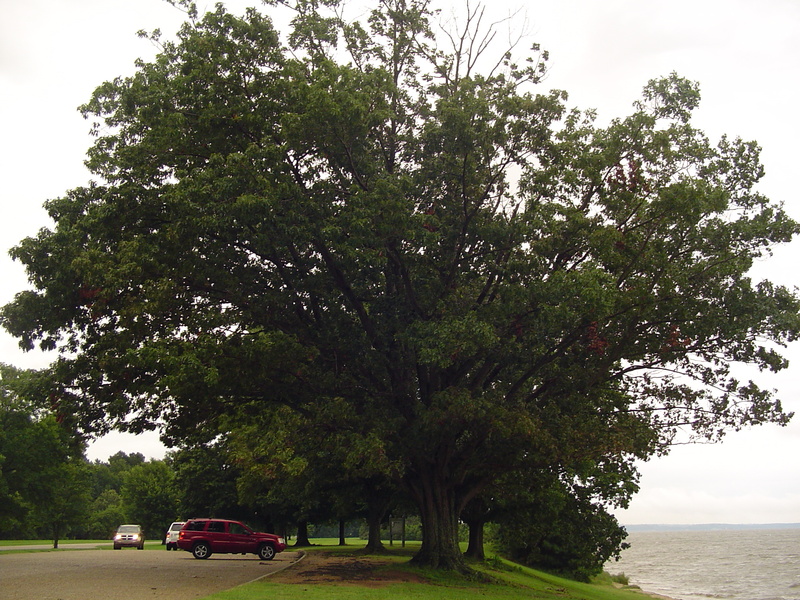 This tree holds the bank of the James River along the Parkway. Eventually, gardening became a passionate pursuit not only of the aristocracy, but for many Britons. As we admire their beautifully tended gardens of trees, shrubs, and flowers today, so they admired the wild and beautiful plants we sent back to them from, “The Colonies”. Magnolia grandiflora growing along the Colonial Parkway near Jametown, VA. Colorful fall leaves were almost unknown in Britain before American species of trees were introduced n the 17th and 18th centuries. Dogwood, our Virginia state tree, blooms in April. As each day grows shorter, the last gilded bits of daylight grow more precious. Sunset, that magical time when every tree and blade of grass stands bathed in golden, rosy light, calls to me each evening. I want to watch its progression until the light has drained out of the sky and the first stars grow bright. The sun’s last rays feel thick and soft reaching across the landscape. The sun grows immensely brighter as it drops towards the horizon, blazing in defiance as it slips, all too quickly, out of sight. And for a few brief moments we bask in its magical light, admiring technicolor clouds, sensing warmth even when there is little left in the evening air. The sun’s touch transforms the ordinary into something beautiful. It draws our attention to details we might otherwise miss. Like a parent’s loving caress at bedtime, its rays reassure us even as night quickly closes in at its passing. Even as the sun pulls ever farther away, its daily circuit ever lower and swifter through the autumn sky, we take more joy in its presence. A sunny day in winter proves a joyful gift; an autumn sunset a gilded treasure. and the heart of the greater realm that shall be. “Be like water making its way through cracks. and you shall find a way round or through it. outward things will disclose themselves. Empty your mind, be formless. Shapeless, like water. If you put water into a cup, it becomes the cup. and it becomes the bottle. You put it in a teapot it becomes the teapot. Now, water can flow or it can crash. We have watched more rain fall in the last two days than I can ever recall. If ‘we’ includes every soul from Jamaica to Maryland, then we have perhaps witnessed the most rainfall in recorded history. It’s ironic that the Daily Post chose “H2O” as the theme for their Weekly Photo Challenge on Friday, as Hurricane Matthew chewed up the Caribbean and the East Coast of the US. Ocean swallowed land, breaking up buildings and piers like tinker toys. Waves crashed over sea walls and battered against homes and hotels. Historic, torrential rains have washed away hillsides and towns. Here, the water flowed. We are blessed with a topography which can handle rain. But all around us in Virginia and North Carolina, at the northern edge of this great storm, it rose. We watched streets become ponds and roads float away, carrying so much of people’s lives and livelihoods on the rising tide. We watched this on TV and the internet, of course; here, we simply watched water run in sheets across the streets, fill the ditches and puddle on the patio. We drove to Jamestown late yesterday afternoon, watching the river rise to the top of its banks and the creeks and marshes fill like bathtubs. Herons stood along the shallows, gazing with curiosity at the rising tide. Yesterday, the world was wet and grey. The clouds hung low and spewed sheets of water from sea to land. And now the storms have moved away. The sun was out here by this afternoon. And with sunlight comes every beautiful color of the day: blue sky, golden flowers, green leaves and shiny patches of lichen on the dark wet bark of trees. Water teaches the lesson of change. As it changes forms itself, so it also changes everything it touches. Judging ‘good’ or ‘bad’ sometimes begs more questions than it settles. Even the lack of water, a summer drought, shows us this truth. And so we learn to flow, like water; to adapt, to reflect, to adjust, and to persist. And above all, to hope to nourish and refresh with our very presence. What can hurt can also heal; what can destroy is also the basic unit of every living thing. most beautiful and expressive feature. “Learning without reflection is a waste. Yes, we had some flooding this weekend. But I didn’t think it was this bad! Slowly, the water is receding; but what a difference a weekend can make! until the object of your attention affirms your presence.